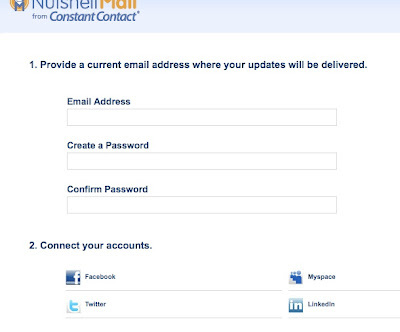 I was excited about the big news this week that Constant Contact was integrating with NutshellMail, for two main reasons: 1. I am a Constant Contact Business Partner, so it's cool to get the advance notice and also to be able to offer e-news clients some neat bonuses, and 2. 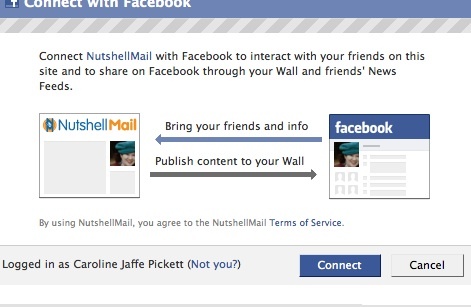 I had been curious about NutshellMail and have wanted to try it for the last few months, so this latest news gave me an excuse to check it out. So here's the deal: I just set up the program about an hour ago, and I can already see the benefits. 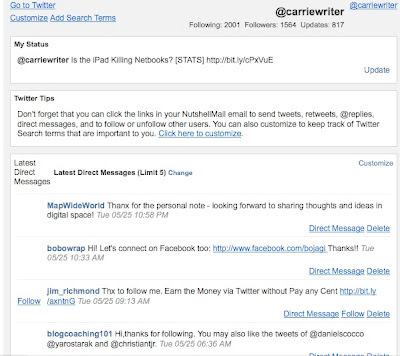 The idea is that you combine all your social network info and integrate it with your e-mail, so all the updates come in as a group, rather then having to sort through messages, updates, posts, and replies, piecemeal. 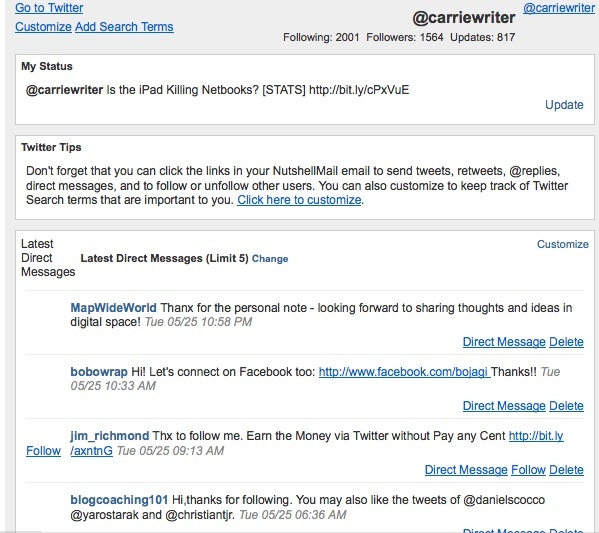 For those folks using Hootsuite, Tweetdeck, or Seesmic Desktop, you may already have gotten used to some of these automated features, but this program also allows you to integrate with Facebook, Linked In, and Twitter, making it a handy one-stop-shopping experience. 1. Register: Go to https://nutshellmail.com/register/ to set up your account, by providing your e-mail address, a new password, and the social media accounts you want to connect to. These will be the ones included with your e-mail updates. 2. Allow Access: You will need to Allow Access by granting permission to connect with your social network sites. For example with Facebook, this allows you to post to your Wall, as well as "Comment," "Like," "Share," and "Reply to Wall." 3. Confirm Registration: Go to your Inbox to confirm your registration. You will notice that on the confirming registration e-mail, your status updates and preferences already appear in the lower half of the e-mail for you to review. 4. Review Updates: Here's a screen capture of the feeds that display automatically. Notice with Twitter, here my most recent update appears, and when I continue scrolling, I get the latest direct messages, tweets, and replies from those I'm following. 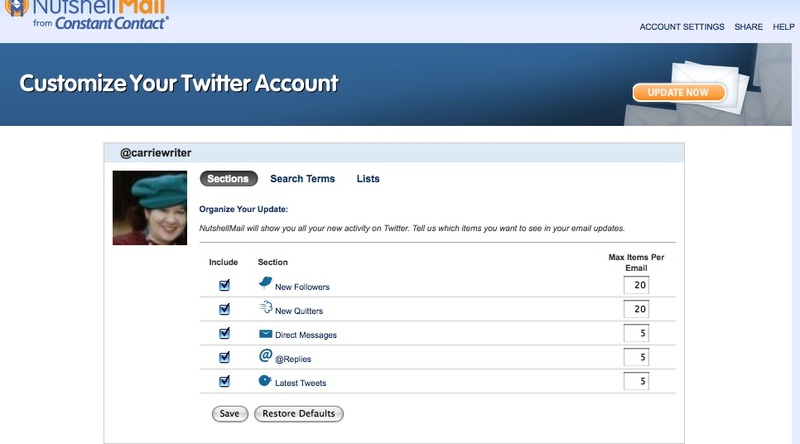 I can update my status right from the e-mail, as well as direct message, follow, and delete. I can also do a Search by clicking on the Add Search Terms icon. Haven't tried it yet, but I will. Notice there's a "Customize" option, I'm getting to that next. 5. Customize: There's a lot of customization you can do here. In the Facebook platform, for example, the user can choose from almost all the main FB features and decide which ones to filter out, if any. On mine, I decided to delete some of the notifications, such as Birthdays and Group Invitations, since I prefer handle those directly in FB.On Twitter, as shown below, you can customize according to Sections you want to receive updates on, as well as Search Terms, and Lists. I had created some lists a few months ago, and it was great to see all the latest Tweets from list members in one spot. You can also schedule the frequency you want to receive updates in your e-mail, as well as the number of updates in each category. The pros clearly are the consolidation of updates and the level of detail you can customize and filter the information. Very impressive. I'm also assuming that when we post our newsletter links, it will make the sharing and forwarding all the easier. I can also see eliminating some redundancy that can occur when there are too many connected feeds and double or even triple posting occurs. I like the idea of disconnecting some of my feeds so that I can post my updates in a more targeted way to my social networks and see it all consolidated in one screen. Less confusing. Cons? None so far! Three small points though -- be sure to confirm your registration before you start any actions such as messaging or replying on that first confirming e-mail/preview, or you will just get an error message. At least, that's what happened to me. Also, when your update e-mail arrives, you may think items are missing. 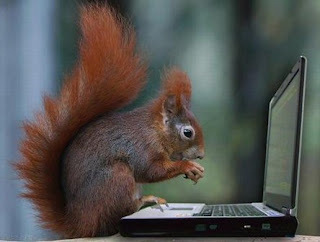 I'm in G-mail and Firefox, and I had to open a new tab to see the entire screen so that all my social networks showed up. Finally, based on the few minutes I just experienced with all this, I can see the need for pretty aggressive filtering. If you check yes to everything, it's a lot of updates to process. So, that's it in a nutshell! I'm curious how other NutshellMail users are liking it so far, and how it compares with other aggregators. Feel free to post your comments here. "Hi Caroline. At this point you cannot schedule tweets or advanced posts, but that is a killer suggestions that will be shared with the team. We can't wait to read your blog post!" PPS Are Flickr and YouTube connections coming?